Did Human Rights Watch and The Telegraph use a misleading photo in report on illegal Palestinian child labor? Robert Tait of The Telegraph published a story on April 13th based on a new 74-page report by Human Rights Watch (Israel: Settlement Agriculture Harms Palestinian Children) claiming that Palestinian children “as young as 11” are being employed under dangerous conditions in Israeli settlements “in breach of international law”. 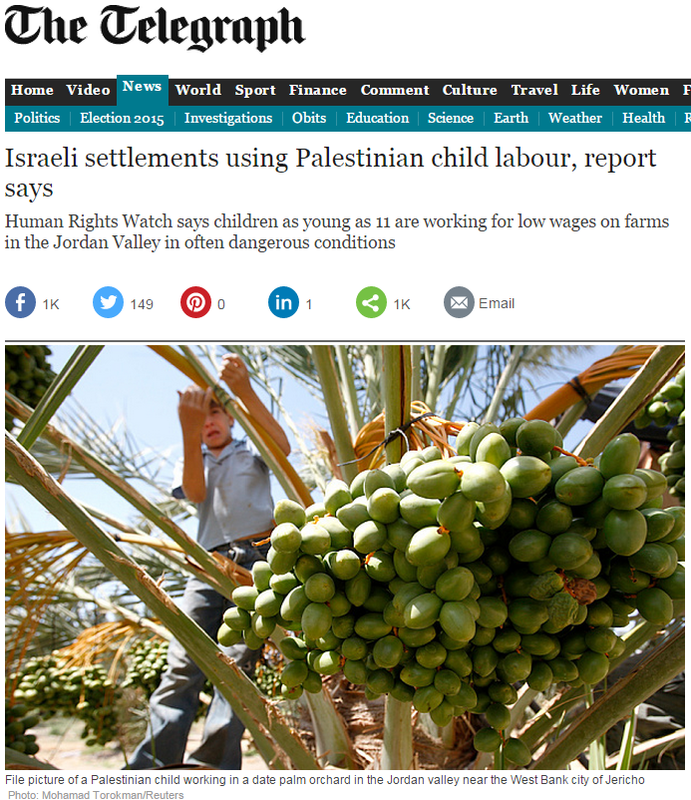 Both The Telegraph article and the HRW report used the same photo to illustrate the alleged illegal use of child labor by Israeli settlement farms in the Jordan Valley. The child in the photo appears to be perhaps 11 or 12. However, a look at the original photos taken by a Reuters photographer suggests that the photos used by The Telegraph and HRW may be misleading. The series of photos, which include the photo of the boy used by The Telegraph and HRW, were taken by Reuters’ photographer Mohamad Torokman in 2010, and appear to illustrate work at a Palestinian farm. Here’s the second photo in the Reuters series (also taken on May 24th, 2010) of what appears to be the same boy at the same farm. Now, here’s the third photo in the series also taken on May 24th. The caption notes that the owner of the date palm orchard is a Palestinian named Naeem Issawi. 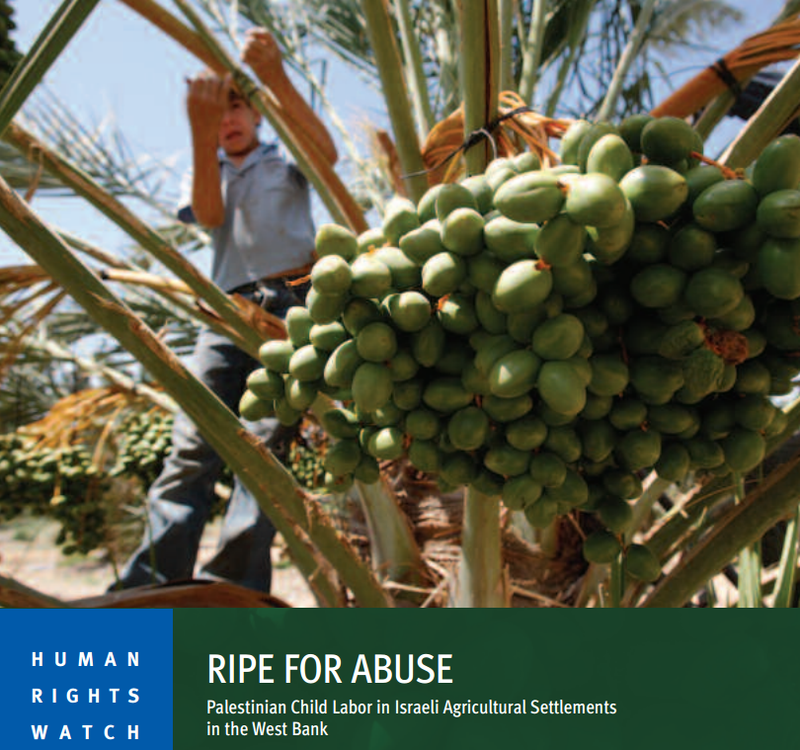 So, a 74-page report by HRW on the Israeli use of illegal Palestinian child labor appears to have misled readers by using a photo which actually illustrates the Palestinian use of illegal Palestinian child labor. The significance of this misleading photo would not be lost to those who read a series of articles by former AP Jerusalem correspondent Matti Friedman. Friedman argued that journalists covering the region learn very quickly that “what is important in the Israel-Palestinian story is Israel” and Israel’s alleged abuse of Palestinian human rights. Facts concerning the abuse of Palestinian human rights by other Palestinians (including Palestinian leaders) is not part of the MSM story. The alleged problem of Israeli settlements illegally employing Palestinian children is consistent with the media’s myopic focus on Israel. However, the problem (unexplored by HRW or The Telegraph) of Palestinian children being illegally employed (per the photo) by fellow Palestinians is certainly not consistent with the desired narrative. We’ve contacted HRW and Telegraph editors seeking comment on the photo, and will update this post when they reply. They are throwing the kitchen sink at Israel. murders of their women and children for honor reasons or some other reason understood only by Arabs. before. Part of the NGO m.o. .
Great catch. Perhaps it is time to consider a regime of licensing NGOs, with permits dependent on accuracy, honesty, ethical standards and all that normal stuff. How many of these cowboy outfits would pass an independent audit of those aspects? In other words, HRW witnessed none of this alleged abuse of child laborers. Just some more unreliable, politically motivated rumor mongering from Sarah Leah Whitson et al, who have been caught pushing Arab war propaganda on many occasions while calling themselves a human rights organization. Again smearing the innocent on behalf of the guilty using children as props. They ought to be prosecuted. Judging from the photo my guess is they are trying to make their own metaphor into something literal. Ken Roth draws a six figure salary from donations to HRW, many of those donations come from good-hearted people scratching out living. Ken then supplies them with fantasies of greedy Jews financially profiting from the abuse of children, feeding long-established anti-Semitic tropes. So who’s the greedy and abusive profiteer here? You have come across a wider topic. That of the entire NGO, academia and ‘press’ gravy train. It is essentially a state of mind financed by donations and government aid. The UN is part of this. Poor Israel. As if it’s not enough to have to deal with enemies on every single one of her borders [and the rest of the international community’s media], she also has to cope with the Jew-hating liars known as ‘NGOs’; the worst offenders are Amnesty International, HGW, BT’selem and the UN. I despair when I read an article such as this that continually disseminates lies upon more lies. When will the world wake up, if ever? Looks like HRW is abusing children for propaganda against Israel. Did HRW ever protest the misuse of children by the Palestinian terror organisations? Anne is correct. Calling this farce “misleading” is just the same as calling the medieval blood libel “misleading.” Human Right Watch is clearly and openly iniciting against Jews using false witness accounts pictures exactly like their predecessors during the centuriesa and people fighting against racism should treat them accordingly.